Bruckner began work on his Ninth Symphony in the autumn of 1887. He was still working on it on the day he died, nine years later on 11 October, 1896. By the autumn of 1894, when the first three movements of the Ninth Symphony were completed in full score, Bruckner’s health had started to fail, along with his powers of concentration. There was also a marked increase in the nervous obsessive behaviour which had perplexed and worried his friends in the past. Secondly, there had been the weight of less important but pressing work to distract him—extensive revisions of the First, Second, Third and Eighth Symphonies and the Masses in E minor and F minor, and the composition of two substantial choral works: the 150th Psalm and the cantata Helgoland. Tragically, the Ninth Symphony remained unfinished. The immense finale, nearly complete in sketch-score, begins to tail off not long before the end. This has led some to imagine that Bruckner didn’t know how to end the symphony—that the triumphant coda he intended couldn’t be made to work, and that the world is probably better off with the symphony as it is: a magnificent three-movement torso. That may be a comforting belief, but it’s almost certainly misplaced. Dr. Heller describes how Bruckner ‘went over to the piano and played me parts of the symphony with shaking hands, but with undiminished accuracy and strength. I have often regretted the fact that I cannot play or write down music after one hearing, because then I might be able to give some idea of the end of the Ninth Symphony.’ Bruckner’s biographer Max Auer describes a page of the score—apparently near the end of the finale—in which all the main finale themes appear ‘piled on top of each other, as in the finale of the Eighth Symphony’. Alas, this crucial page has vanished, and we can only guess as to what its effect might have been. Yet the three movements Bruckner did complete offer a remarkably satisfying musical experience—rather like the two surviving movements of Schubert’s ‘Unfinished’ Symphony. The Ninth Symphony has been performed and recorded so often in its three-movement form that for many it has come to be seen as complete in itself. The structure as it stands—two long, predominantly slow movements, framing a shorter, faster Scherzo—is well balanced, and the calmly resigned coda of the Adagio, with its fleeting references to earlier works, can be seen as a kind of answer to the agonised probing of the first movement and the nightmare visions of the Scherzo. It could be that when Bruckner’s pupil Gustav Mahler ended his Ninth Symphony with an intensely striving, ultimately resigned adagio, he had the example of Bruckner’s Ninth in mind. Agonised probing, nightmare visions—these are not the kind of terms one expects as a description of a ‘hymn of praise to God’. But the spiritual journey of the Ninth Symphony as it stands is, on the whole, a very dark one. This may tell us something about the state of Bruckner’s mind and of his faith in his final years. There is evidence that the composer’s belief in a merciful God wavered while he was writing the Ninth Symphony. Certainly it’s hard to resist the impression that the prospect of death left a deep imprint on the character of this symphony. 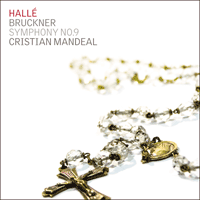 Nowhere else in Bruckner’s output does one encounter such unsettlingly ambiguous harmonies and tortured melodic lines—the opening theme of the Adagio, with its upward ‘missed octave’ leap, is as pained as anything in Mahler. And yet the musical architecture often has the same grand, spacious feeling one finds in the earlier symphonies—the quality which has led to Bruckner’s symphonies being described as ‘cathedrals in sound’. In the two big outer movements, the underlying current is slow, however animated the musical surface may appear. To newcomers, the first movement’s structure may seem mystifying: there are so many themes, so many changes of course that the comforting outlines of the basic musical recipe of sonata form can be difficult to make out. Often the music seems to break off at its point of maximum intensity, only to begin building again in a new direction. But as this huge, ‘solemn’ movement approaches its shatteringly powerful coda, one gets the feeling that Bruckner is at last drawing his broken threads together, the end justifying everything. Listening to the Scherzo for the first time, one may find it difficult to believe that this is music from the 19th century: the weirdly equivocal harmonies and pounding full-orchestral dissonances or the alarming moments when the tonal foundations shake under our feet—all this seems closer to Bartók, Prokofiev or Shostakovich. The Adagio brings at last music of true Brucknerian nobility, especially the hymn-like elegy for the four so-called ‘Wagner tubas’ (really tenor and bass horns) after the first climax. Apparently Bruckner called this theme ‘Farewell to Life’. There are moments of radiance too amid the anguished crescendos and long wintry melodies. But the last, and biggest climax contains the most anguished music in the whole symphony, with trombones, tuba and other bass instruments bellowing out the Adagio’s opening ‘missed octave’ violin theme, triple forte. The final discord is left hanging in the air, unresolved. But then comes the coda, bringing a sense of peace and tonal stability, fragile at first, but growing steadily in warmth and solidity. This may be a long way from the jubilant hymn with which Bruckner apparently intended to finish his Ninth and last Symphony; it may only be the close by default, yet it is still one of the most touching endings in symphonic literature. Bruckner commença de travailler à sa Neuvième Symphonie durant l’automne 1887. Elle était encore sur le métier le jour où il mourut, neuf ans plus tard, le 11 octobre 1896. À l’automne 1894, l’orchestration des trois premiers mouvements de la Neuvième Symphonie était achevée, mais la santé de Bruckner avait commencé à décliner, tout comme ses facultés de concentration, et son comportement nerveux et obsessionnel, qui avait dérouté et inquiété ses amis par le passé, s’était nettement aggravé. En outre, il avait été distrait par la pression de tâches moins importantes mais pressantes: des révisions en profondeur des Première, Deuxième, Troisième et Huitième Symphonies et des Messes en mi mineur et fa mineur, et la composition de deux œuvres chorales substantielles: le Psaume 150 et la cantate Helgoland. Hélas, la Neuvième Symphonie ne fut pas achevée. L’immense finale, dont l’ébauche est complète, commence à se déliter avant sa conclusion. À cause de cela, certains ont cru que Bruckner ne savait pas comment terminer sa symphonie, qu’il n’arrivait pas à faire fonctionner la triomphante coda qu’il avait en tête, et selon eux le monde se porte sans doute mieux avec l’ouvrage tel qu’il est: un magnifique buste de trois mouvements. Cette impression est peut-être réconfortante, mais elle est certainement erronée. Selon le récit du docteur Heller, Bruckner «se mit au piano et me joua des passages de la symphonie; ses mains tremblaient, mais sa précision et sa force étaient intactes. J’ai souvent regretté de ne pas savoir jouer ou écrire de la musique après une seule écoute, car alors j’aurais été capable de donner quelque idée de la fin de la Neuvième Symphonie.» Max Auer, le biographe de Bruckner, décrit une page de la partition—apparemment située vers la conclusion du finale—où figurent tous les grands thèmes du dernier mouvement, «entassés les uns sur les autres, comme dans le finale de la Huitième Symphonie». Hélas, cette page essentielle a disparu, et nous ne pouvons que nous imaginer l’effet qu’elle devait produire. Pourtant, les trois mouvements achevés par Bruckner constituent une expérience musicale remarquablement satisfaisante—un peu comme les deux mouvements existants de la Symphonie «Inachevée» de Schubert. La Neuvième Symphonie a été exécutée et enregistrée si souvent sous sa forme en trois mouvements, que beaucoup en sont venus à la considérer comme complète ainsi. Sa structure telle qu’elle se compose—deux longs mouvements majoritairement lents encadrant un Scherzo plus bref et plus rapide—est bien équilibrée, et la coda calmement résignée de l’Adagio, avec ses fugaces références à des œuvres antérieures, peut être vue comme une sorte de réponse au questionnement angoissé du premier mouvement et aux visions cauchemardesques du Scherzo. Peut-être que lorsque l’élève de Bruckner Gustav Mahler conclut sa Neuvième Symphonie par un adagio intensément combatif et finalement résigné, il avait à l’esprit l’exemple de la Neuvième de Bruckner. Questionnement angoissé, visions cauchemardesques, ce n’est pas vraiment à ce type de description que l’on s’attend pour dépeindre un «hymne à la gloire de Dieu». Mais le voyage spirituel de la Neuvième Symphonie tel que nous le connaissons est, dans son ensemble, très sombre. Cela nous donne sans doute une indication de l’état d’âme de Bruckner et de sa foi à la fin de sa vie. Il y a de bonnes raisons de penser que la croyance du compositeur en un Dieu de clémence chancelait alors qu’il écrivait la Neuvième Symphonie. Difficile en tout cas de se déprendre de l’impression que la perspective de la mort a profondément marqué le caractère de la symphonie. On ne rencontre nulle part ailleurs dans l’œuvre de Bruckner des harmonies d’une ambiguïté aussi dérangeante et des lignes mélodiques aussi torturées—le thème initial de l’Adagio, avec son saut ascendant de neuvième mineure, est aussi douloureux que peut l’être Mahler. Et pourtant l’architecture musicale produit souvent la même impression monumentale et spacieuse que l’on trouve dans les symphonies antérieures—qualité qui a fait dénommer les symphonies de Bruckner des «cathédrales sonores». Aussi animée que puisse paraître la surface musicale des deux grands mouvements externes, le courant qui la soustend est lent. Pour ceux qui l’entendent pour la première fois, la structure du premier mouvement peut sembler déroutante: il contient tant de thèmes, tant de revirements, que les contours rassurants de la traditionnelle forme-sonate peuvent être difficiles à discerner. Le discours semble souvent s’interrompre à son point d’intensité maximale pour recommencer à s’ériger dans une nouvelle direction. Cependant, tandis que cet immense mouvement «solennel» approche de sa coda à la puissance dévastatrice, on a l’impression que Bruckner rassemble enfin sa texture effilochée, la conclusion venant tout justifier. En écoutant le Scherzo pour la première fois, on pourrait avoir du mal à croire qu’il s’agit d’une page du XIXè siècle: les harmonies étrangement équivoques et le martèlement des dissonances de l’orchestre au complet ou les passages alarmants où les fondements tonaux tremblent sous nos pas, tout cela semble plus proche de Bartók, Prokofiev ou Chostakovitch. L’Adagio présente enfin une musique d’une vraie noblesse brucknerienne, notamment l’élégie semblable à un hymne confiée à quatre «tubas Wagner» (en réalité des cors ténor et basse) après le premier apogée. Apparemment, Bruckner appelait ce thème «L’Adieu à la vie». On trouve aussi des moments chatoyants parmi les crescendos angoissés et les longues mélodies glacées. Mais c’est le plus grand le dernier apogée, qui contient la musique la plus angoissée de toute la symphonie, avec les trombones, le tuba et d’autres instruments graves qui mugissent le thème initial de l’Adagio sur un triple forte. Cette discorde finale reste suspendue dans les airs, sans résolution. Mais c’est alors que vient la coda, apportant une sensation de paix et de stabilité tonale, d’abord fragile, puis acquérant progressivement chaleur et solidité. Si l’on est bien loin de l’hymne jubilatoire que Bruckner semblait avoir en tête pour conclure sa Neuvième et dernière Symphonie, et s’il ne s’agit que de la conclusion par défaut, cela reste quand même l’une des plus émouvantes du répertoire symphonique. Bruckner begann im Herbst 1887 mit der Arbeit an seiner Neunten Sinfonie. Als er neun Jahre später, am 11. Oktober 1896 verstarb, war er immer noch damit beschäftigt. Im Herbst 1894, als die ersten drei Sätze der Neunten als Dirigierpartitur vorlagen, hatte sich sein Gesundheitszustand verschlechtert, ebenso seine Konzentrationsfähigkeit. Auch hatte sich bei ihm die Tendenz zu zwanghaft nervösem Verhalten, die seine Freunde schon zuvor verwirrt und beunruhigt hatte, deutlich verstärkt. Des Weiteren hatte ihn die Belastung weniger wichtiger, aber dringlicher Arbeit abgelenkt—dabei handelte es sich um weit reichende Überarbeitungen der Ersten, Zweiten, Dritten und Achten Sinfonie sowie der Messen in e-Moll und f-Moll, außerdem die Komposition zweier substanzieller Chorwerke, des 150. Psalms und der Kantate Helgoland. Andere Freunde und Kollegen erinnerten sich an ähnliche Bemerkungen. Sie strafen die althergebrachte Ansicht Lügen, Bruckner sei als Künstler von besonderer Unsicherheiz geplagt gewesen. Während die meisten Komponisten den Vergleich mit Beethovens mächtiger Neunter gescheut hätten, forderte Bruckner ihn geradezu heraus. Aber dahinter steckte mehr als übermäßig selbstsichere Arroganz. Die Widmung der Sinfonie zeigt, dass Bruckner seine Neunte als besonderen Ausdruck seines Glaubens verstand. Richard Heller, Bruckners Arzt während der letzten anderthalb Jahre seine Lebens, war sicher, dass der Komponist ein Übereinkommen mit seinem „lieben Gott“ getroffen hatte. Sollte es ihm gefallen, dass die Sinfonie, in der Tat als Hymne zum Lobe Gottes gedacht, fertig gestellt werden könne, würde er Bruckner genug Zeit für diese Aufgabe lassen; starb er zu früh, so dass sein musikalisches Opfer unvollendet blieb, habe Gott sich das nur selbst zuzuschreiben. Tragischerweise blieb die Neunte Sinfonie unvollendet. Das immense Finale, als Partiturentwurf fast fertig, beginnt kurz vor dem Schluss zu ersterben. Das hat manche zu der Annahme verleitet, Bruckner habe nicht gewusst, wie die Sinfonie zum Abschluss zu bringen sei—dass die von ihm geplante triumphale Coda nicht zu realisieren war und die Welt wahrscheinlich besser daran tut, sich mit der Sinfonie in ihrem hinterlassenen Zustand als großartiger dreisätziger Torso zu bescheiden. Das mag ein beruhigender Gedanke sein, doch ist er mit ziemlicher Sicherheit fehl am Platze. Dr. Heller beschreibt, wie Bruckner ans Klavier trat und ihm mit zitternden Händen, doch unverminderter Sicherheit und Kraft Teile der Sinfonie vorspielte. Oft bedaure er, Musik nicht nach einmaligem Hören spielen oder aufschreiben zu können, sonst habe er womöglich einen Eindruck vom Ende der Neunten Sinfonie vermitteln können. Bruckners Biograph Max Auer beschreibt ein Blatt der Partitur—anscheinend zum Ende des Finals hin—, auf dem alle wesentlichen Finalthemen übereinander geschrieben waren, wie im Finale der Achten Sinfonie. Leider ist dieses wesentliche Blatt verloren gegangen, und man kann nur darüber spekulieren, welche Wirkung es gehabt haben könnte. Doch die drei Sätze, die Bruckner tatsächlich fertig stellte, bieten ein bemerkenswert befriedigendes Musikerlebnis—vergleichbar den beiden erhaltenen Sätzen von Schuberts „Unvollendeter“. Die Neunte Sinfonie ist so oft in ihrer dreisätzigen Version aufgeführt und eingespielt worden, dass viele sie in dieser Form als vollständig ansehen. Der existierende Aufbau—in zwei langen, im Wesentlichen langsamen Sätzen, die ein kürzeres, schnelleres Scherzo umrahmen—wirkt ausgewogen, und die gelassen resignierte Coda des Adagios mit ihren flüchtigen Verweisen auf vorangegangene Werke kann in gewisser Weise als Antwort auf das gequälte Forschen des Kopfsatzes und die alptraumhaften Visionen des Scherzos angesehen werden. Womöglich hatte Bruckners Schüler Gustav Mahler das Vorbild von Bruckners Neunter im Sinn, als er seine eigene Neunte Sinfonie mit einem zutiefst strebenden, schließlich resignierenden Adagio beschloss. Gequältes Forschen, alptraumhafte Visionen—das sind keinesfalls Begriffe, die man als Beschreibung einer Hymne zum Lobe Gottes erwartet. Doch ist der spirituelle Verlauf der Neunten Sinfonie in ihrer erhaltenen Form im Ganzen ausgesprochen düster. Man könnte daraus einiges über Bruckners Geisteszustand und seinen Glauben in den letzten Lebensjahren entnehmen. Es gibt Hinweise darauf, dass der Glaube des Komponisten an einen gnädigen Gott während der Arbeit an der Neunten schwankte. Man kann sich jedenfalls kaum des Eindrucks erwehren, dass die Erwartung des Todes tiefe Spuren im Wesen dieser Sinfonie hinterlassen hat. Nirgends sonst im Schaffen Bruckners stößt man auf so beunruhigend vieldeutige Harmonien und derart gequälte Melodielinien—das Eröffnungsthema des Adagios mit seinem Aufwärtssprung um eine „ausgelassene Oktave“ wirkt so qualvoll wie nur irgendetwas im Schaffen Mahlers. Und doch vermittelt der musikalische Aufbau oft ein ebenso grandioses, weitläufiges Gefühl, wie es in den früheren Sinfonien zu spüren ist—was dazu geführt hat, dass Bruckners Sinfonien als „Kathedralen der Klänge“ beschrieben wurden. Die beiden umfangreichen Ecksätze fließen im Grunde langsam dahin, ganz gleich, wie lebhaft die Musik an der Oberfläche auch wirken mag. Neulingen mag die Struktur des Kopfsatzes rätselhaft erscheinen: Er enthält so viele Themen, so viele Kurswechsel, dass die befriedigenden Umrisse der grundlegenden Sonatenform schwer zu erkennen sein mögen. Oft scheint die Musik am Punkt der maximalen Intensität abzubrechen, nur um sich in einer neuen Richtung wieder aufzubauen. Doch wenn dieser riesige, „feierliche“ Satz sich seiner erschütternd mächtigen Coda nähert, überkommt einen das Gefühl, dass Bruckner endlich seine abgerissenen Fäden wieder verknüpft und der Endzweck alles Vorhergehende rechtfertigt. Wer sich das Scherzo zum ersten Mal anhört, mag kaum glauben, dass es sich dabei um Musik aus dem 19. Jahrhundert handelt: Die seltsam vieldeutigen Harmonien und stampfenden Dissonanzen im gesamten Orchester, die beunruhigenden Momente, in denen die tonalen Fundamente unter unseren Füssen zu erbeben scheinen—all das klingt eher nach Bartók, Prokofjew oder Schostakowitsch. Das Adagio bringt uns endlich Musik von echt Brucknerscher Noblesse, insbesondere in der hymnischen Elegie für die vier sogenannten „Wagner-Tuben“ (eigentlich Tenor- und Basshörner) nach dem ersten Höhepunkt. Bruckner soll dieses Thema als „Abschied vom Leben“ bezeichnet haben. Inmitten der qualvollen Crescendi und langen frostigen Melodien finden sich auch strahlende Momente. Doch der letzte, größte Höhepunkt enthält die qualvollste Musik der gesamten Sonfinie, wenn Posaunen sowie Tuba und andere Bassinstrumente das Violinthema der „ausgelassenen Oktave“ vom Anfang des Adagios fff herausbrüllen. Die abschließende Dissonanz bleibt unaufgelöst im Äther hängen. Aber dann folgt die Coda und mit ihr ein Gefühl von Frieden und tonaler Stabilität, das anfangs gefährdet scheint, doch stetig an Wärme und Festigkeit zunimmt. Das mag weit entfernt sein von der jubilierenden Hymne, mit der Bruckner offenbar seine neunte und letzte Sinfonie beschließen wollte, es mag nur mangels einer Alternative das Ende darstellen, doch handelt es sich trotzdem um einen der ergreifendsten Schlüsse im sinfonischen Repertoire.